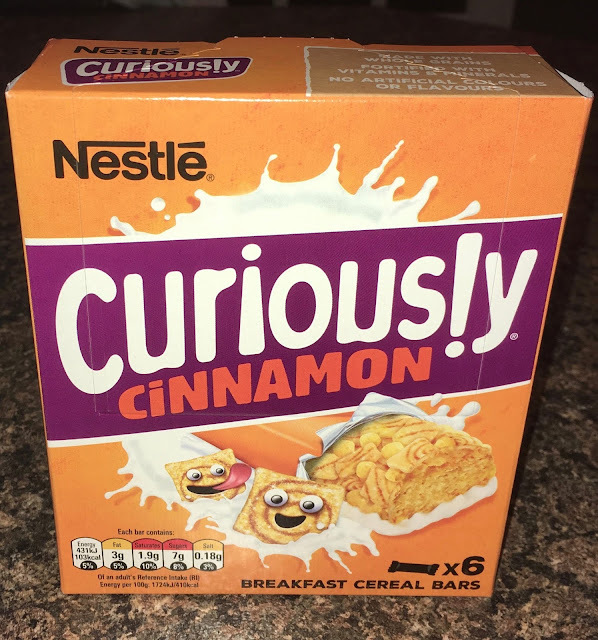 I don’t eat a lot of breakfast cereal, but if I did my preferred choice would be Curiously Cinnamon. Cinnamon is my favourite spice, I love its warming goodness. One of the good things about the current season is the fact that cinnamon starts to appear in lots of things, it really is a winter spice. I always get excited when I find something new or that I haven’t tried before but especially so if it contains cinnamon. Although I don’t buy many cereals I do buy quite a few cereal bars, they are much more easy to eat either on the train or at my desk at work. I found these in Poundland and I haven’t found them before in my usual supermarkets, but I can say the box didn’t have a “new” label on it, which is confusing. Inside the box there are individually packaged bars all in the bright orange Curiously Cinnamon wrapper. Once open I can see the milk flavour base coat on the bottom half of the bar, and the square pieces of the Curiously Cinnamon cereal. The flavour was good but milder than I remember the cereal being. There was a decent amount of spice, and the sweetness and milk taste did work well together. I found this a treat to have, and I love the idea of a portable version as to what would otherwise be my favourite cereal. It was missing the fabulous cinnamon milk you get left with after the real stuff, but this certainly works for convenience. I do hope this isn’t a winter only limited edition, as I’m going to be after some more boxes of these.